Sewing for your dog can be fun as they never complain about the look of the final product. Making a dog coat is great for when the weather is really cold outside and you can make them for an economical price, especially if you wait until fleece is on sale. Depending on how big your dog is, you might be able to get several coats out of 1 yard of fleece. I would definitely choose something washable when creating your dog coat so, when it gets dirty, you can just toss it in the wash. 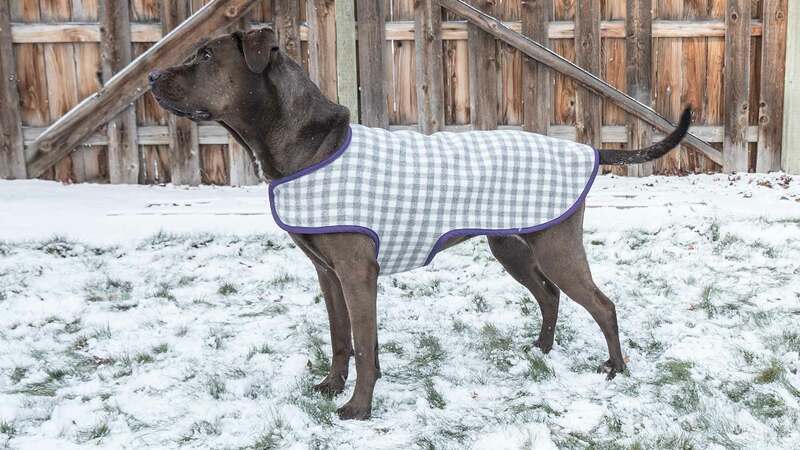 The best part about making this version of the dog coat is that it's possible it can be reversible. You can either use a fabric that is different on both sides, like mine, or use two different fleece fabrics. If you use two different fabrics, you can place them together, wrong side to wrong side, and then just baste around the perimeter of the whole piece. Just be aware that this will make the coat twice as thick so you want to make sure you have a needle that handle that and maybe use a walking foot. This tutorial also shows you how to create your own pattern for the dog coat so you can make it the right size for your dog. We show you what measurements need to take and then how to draft the pattern. Creating and tweaking the dog coat pattern is the most time consuming part but you can totally do it, even if you've never done any pattern drafting before. 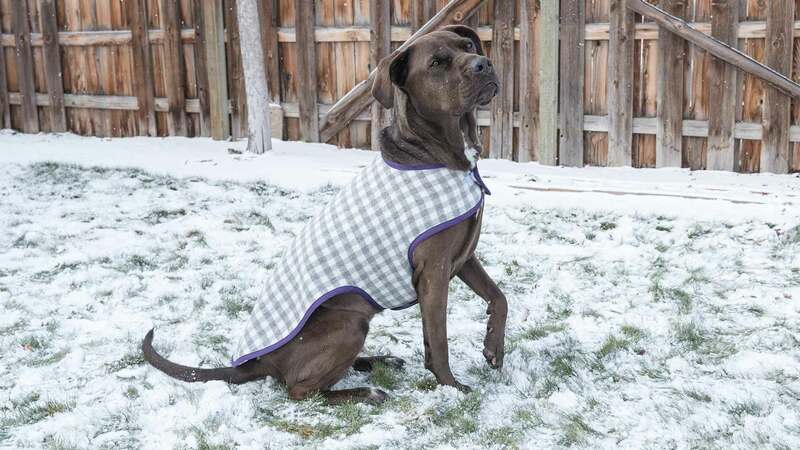 Once the pattern is perfected, you can then create many dog coats easily and quickly. WOW! This was a great tutorial and a great pattern. Thank you so much! I will be using this for years to come!!! Thank you so much for the tutorial! I was wondering how this could be revised to fit an italian greyhound? It seems to fit funny on her in the back and on the neck- it keeps sliding up her long neck. I made this for my Great Dane and it fits perfectly. I used 1 layer fleece and an outside layer of flannel (printed with dog images). I appreciate the measuring sheet and the thoroughness of the video. Thank you very much! Adopted little “Buddy” just hours before the 2016 Blizzard that hit the east coast. Using the instructions for Professor Pincushion’s Dog Coat, I took some left over fleece and – modifying on the fly with two hours before his next scheduled walk – created this coat to keep him warm. The weather was so miserable that he was refusing to exit the house. After “suiting up” he was good to go. A photo is available in my PPC album. The next step will be to fashion a waterproof slicker that will fasten over top of this to stay both warm and dry. Also thinking of extending the back collar to cover a bit more of his neck and making a large buttonhole slit for the harness rings to fit through. Due to his small chihuahua frame I found the “belly” straps actually needed to start immediately behind the chest/neck strap. Not having the time or extra material I had to cheat and cut off the belly straps, sew them back on much closer to the front and cover the gap again with more bias tape. Only been sewing for a *very* short time and found the need to get this whole project completed in under 2-hours to be a great challenge and lots of fun. Looking forward to making version #2. Thank you for your answer. Now, I undesrtand how to create my pattern. I wouldn’ t have needed to ask the question if my English was better. Thank you fo sharing and thank for Gringo. The only file that can be downloaded is the worksheet, the dog image that helps keep track of the measurements. The video itself helps you draft a complete pattern. Please, why I can’t download the pattern, I have got only the dog’s picture with its measurements? The small picture which appears in the frame under “download” is not the picture which appear when I download. I am looking for a pattern for the rainy season. I would like to make this waterproof fabric coat, Gringo will be happy not to get wet, he hates the rain, so it’s a spanich water dog. INCREDIBLE. Thank you very much for the tutorial and excuse my English is not perfect. These are the best directions I have ever seen for designing a dog coat pattern. Once I get them all made, I will have 3 very happy dogs, as they are in need of new coats, but first I have to finish making their quilts.